*These shows are being promoted by what appears to be a car company, Scion, and if you RSVP them at below link you will gain free entry, hey this is better than Europe already! Venue details etc are available at this link as well. First of the videos of Dopplereffekt live from US tour. This was Miami. Review of what happened at Hollywood show. Always a risk with a free show. 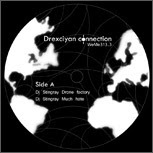 The Heinrich Mueller/DJ Stingray 12" known as 'Drexciyan Connection' is now available. Limited to just 450 copies. Details here. Two YouTube Adverts for upcoming Dopplereffekt US tour. Two videos of Dopplereffekt at La Casa Encendida, Madrid on 24th April 2009. Previews for all three upcoming Zerkalo 12" EPs up now on Clone.